Artist Andrea Maack has launched Cornucopia, a new unisex fragrance. The notes include green pepper, bigarane [sic], cypress, cumin, angelica, incense, candied fig, styrax and black musk. 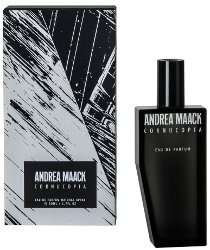 Andrea Maack Cornucopia is available in 50 ml Eau de Parfum, €98. I’d like to try this and some of her more recent releases based on how much I like Coven. Worth a shot! I keep changing my mind about the new bottles, but they are striking.